Older workers in China and other Asian nations are most vulnerable to displacement from increasing adoption of workplace automation, according to “The Twin Threats of Aging and Automation,” a new report released by Marsh & McLennan Companies’ (NYSE: MMC) Global Risk Center. The convergence of an aging global population with workplace automation is expected to have significant economic and societal consequences, particularly in major Asian countries, where low-skilled workers between the ages of 50 and 64 are becoming an increasingly greater proportion of the active workforce (see “About the Report”). To garner insight on the related risks of societal aging and workplace automation, the Global Risk Center brought together experts from two of Marsh & McLennan Companies’ leading professional services firms, Mercer and Oliver Wyman, to aggregate and analyse market-specific economic data to quantify the risk posed by automation to older workers in 15 countries across Asia, Europe and the Americas (see “Figure 1”). The study found that five out of the top six countries – China, Vietnam, Thailand, South Korea and Japan – were located in the Asian Pacific. Older worker jobs in China are at the greatest risk of displacement. On average, Chinese workers are doing jobs that are 76 percent automatable. 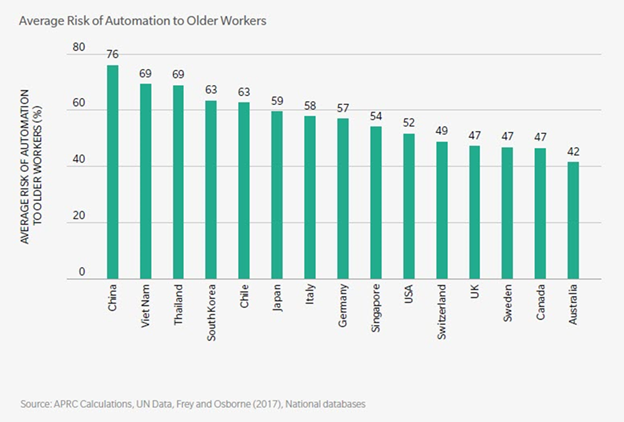 Canada (47 percent) and Australia (42 percent) have the lowest rates of aging of the 15 markets analyzed and the lowest risk scores, making older workers in these countries relatively less susceptible to automation. Even in countries with high concentrations of advanced-skill workers whose jobs are typically harder to automate – including Singapore, Japan, South Korea, Germany and Italy – older worker jobs are still relatively susceptible to automation and worker displacement can occur across occupations and age groups. In the United States, older workers are doing jobs that are on average 52 percent automatable. To download the full report, please visit here, here, or here. Using data from the United Nations (UN), the authors calculated the number of older workers employed in each of the UN’s nine categories of employment. For most countries, older workers are defined as those still active in the workforce between the ages of 50 and 64 – with the exception of Canada (45-64) and the United States (55-64). By mapping these nine categories to “risk of automation” values from University of Oxford researchers Martin Frey & Carl Osbourne, the authors then generated weighted-average scores for the automation risk to older workers for each nation, computing the Average Risk of Automation to Older Workers score. Marsh & McLennan Companies (NYSE: MMC), is the world’s leading global professional services firm in risk, strategy and people. Marsh & McLennan Companies’ Global Risk Center Center addresses the most critical challenges facing enterprise and societies around the world by bringing together leaders from industry, government, non-governmental organizations, and the academic sphere to explore new approaches to problems that require shared solutions across businesses and borders.Mercer delivers advice and technology-driven solutions that help organizations meet the health, wealth and career needs of a changing workforce. Mercer’s more than 23,000 employees are based in 44 countries and the firm operates in over 130 countries. Oliver Wyman is a global leader in management consulting. With offices in 50+ cities across nearly 30 countries, Oliver Wyman combines deep industry knowledge with specialized expertise in strategy, operations, risk management, and organization transformation. The firm has more than 4,700 professionals around the world who help clients optimize their business, improve their operations and risk profile, and accelerate their organizational performance to seize the most attractive opportunities. For more information, visit www.mercer.com and www.oliverwyman.com. Follow Mercer on Twitter @Mercer and Oliver Wyman @OliverWyman. With nearly 65,000 colleagues and annual revenue of over $14 billion, Marsh & McLennan helps clients navigate an increasingly dynamic and complex environment through its market-leading companies including Marsh, Guy Carpenter, Mercer and Oliver Wyman. For more information, visit mmc.com, follow us on LinkedIn and Twitter @mmc_global or subscribe to BRINK.